For other running routes, see Route List. New York, New York, so good they named it twice. Well, I like New York, anyway. As dirty, loud and ugly as it often is, it's still a fun place to be, even if it is fairly anti-runner. There are very few quiet corners in Manhattan, almost every street is busy, and the long NYC shorelines are mainly lined by freeways and are no place for normal humans. But there IS Central Park, and that makes up for a lot. Central Park is a varied, beautiful oasis stretching for 50 (!!) blocks through the heart of the island. And nowadays you can run there without first strapping on a kevlar vest and clipping in the ammo-cartridge of your own AK-47. I've even jogged there in the evenings and felt safe enough. This route will take a loop through nearby Midtown, which borders Central Park on the south, head up through the park, and come back through the East Side. It's a fairly long route, but you could shorten it by 3 km by avoiding the Hell's Kitchen loop, or turn back earlier in Central Park. Or you could start right at Central Park itself: the loop through the park alone is just 8 kilometers. Midtown is where most travelers stay and spend their evenings, with Times Square, Broadway, Rockefeller Center, Macy's, Bloomingdales, Tiffany's, Park Avenue, the Empire State Building, Madison Square Gardens, the United Nations: in short, most of the tourist stuff that everyone expects on a New York trip. 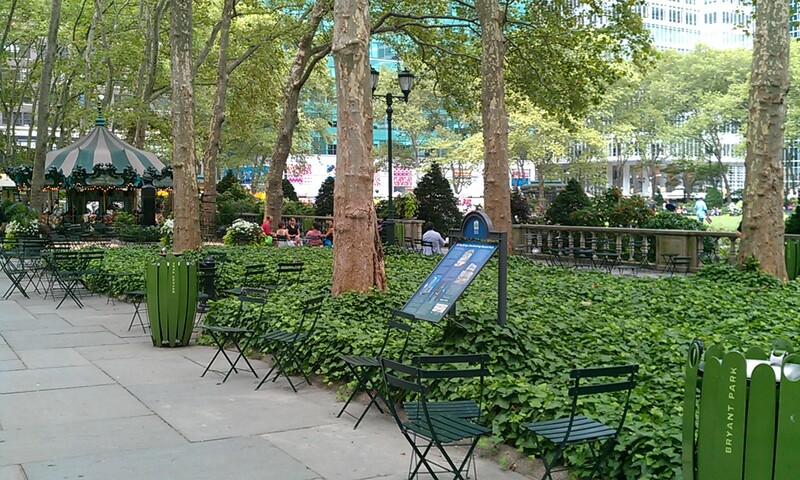 We'll start out in Midtown's own small oasis, Bryant Park, behind the New York Public Library. 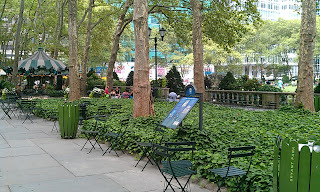 This is the place to sit and drink a coffee and enjoy the Manhattan mornings, so we can relax here when we're done. I confess that I have long been in love with this park, with its outdoor lending library (even a kids' one). Head west on W. 40th Street the one block to Broadway, then turn right. 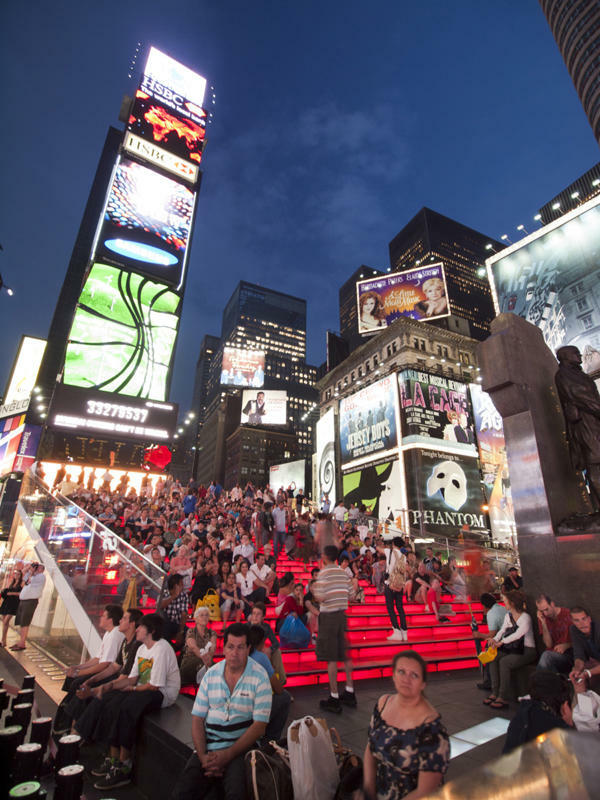 In just two blocks you'll be right in Times Square, with its neon and theaters. 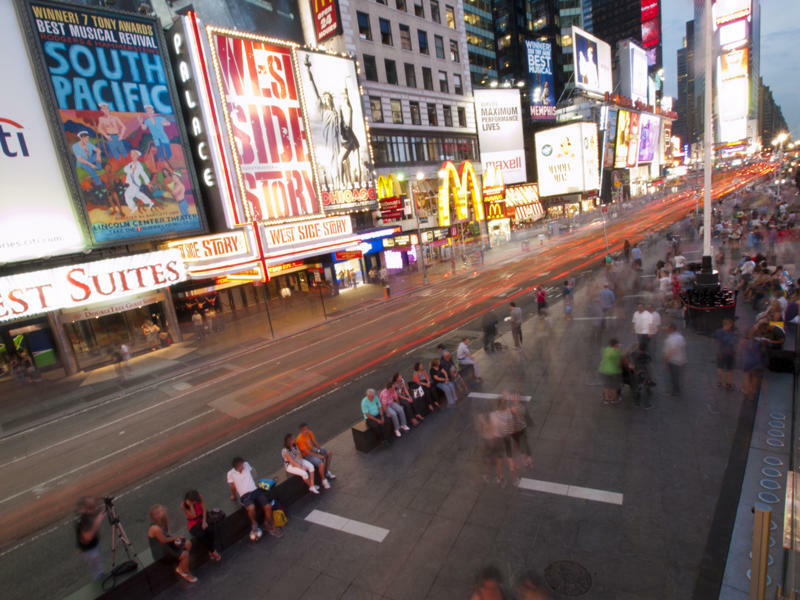 This is New York's theater district, with Broadway theaters found in all the side streets. 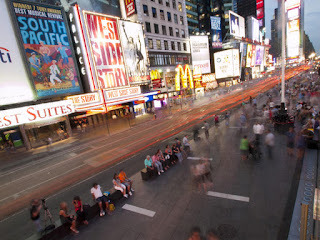 Just at the north end of Times Square, turn left on 44th Street for a loop through a typical old-fashioned New York neighborhood, Hell's Kitchen. The area was once so poor that the buildings were spared redevelopment, and the streets have kept their 100-year-old character. 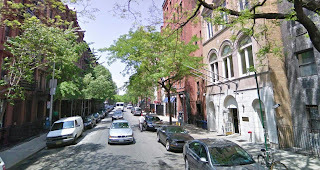 Nowadays Hell's Kitchen has returned to life, and is home to a lot of actors from the nearby theaters, and is no longer run by the Westies Irish street gang. Run straight to 10th Avenue, then turn right and run north for 4 blocks to 48th Street, to turn right and run back towards Broadway, to complete the Hell's Kitchen loop. 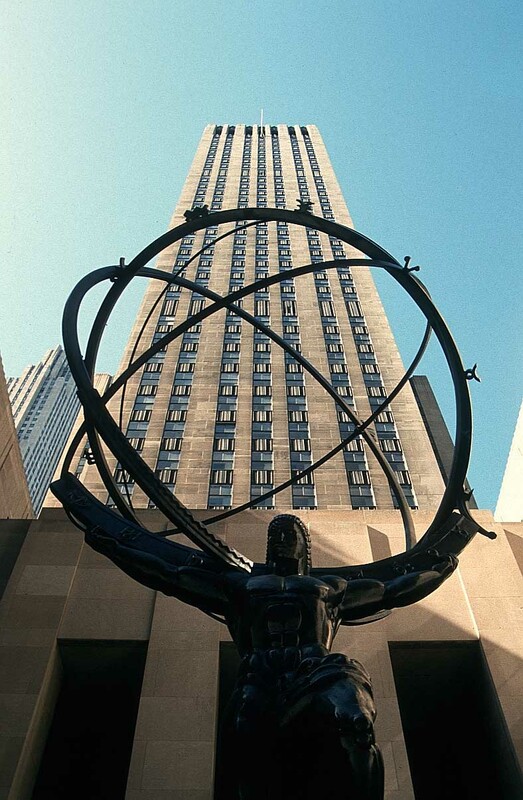 Run straight across Broadway and keep going east until you cross 6th Avenue, where the Rockefeller Center complex rises to your left. Turn left into the little side street called Rockefeller Plaza. Just ahead, on the right, you'll see the famous spot where the ice-skating rink is set up each winter. These buildings are full of broadcast companies and studios, and it's possible to pick up tickets to a lot of shows here (reserve well in advance!). Turn right on 50th Street, and run the hundred meters to 5th Avenue, where St. Patrick's cathedral sits a bit out of place, in all its gothic glory. Now run north (left) on 5th Avenue the 9 blocks to Central Park. 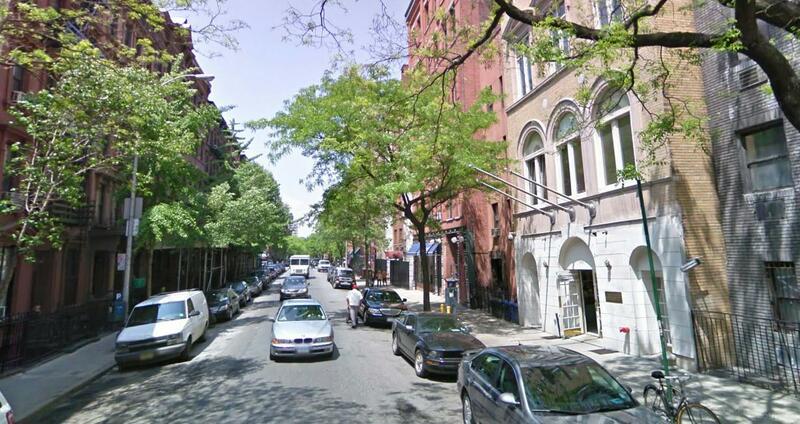 At 58th Street, you'll see the beautiful Plaza Hotel on the left, and the Apple store across the street. Run over to the hotel and then cross 59th Street to the park entrance. 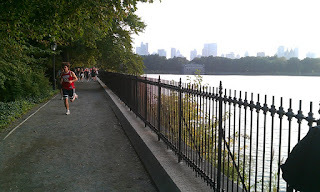 NOTE: If you shorten the run to only do Central Park, this is the place to start! You'll find some steps leading down onto the park's East Drive, where you can run northwards, with the Pond on the left. Central Park is a great mixture of rock outcroppings, park-like lawns, athletic fields, ponds, cafés and woods. We'll try to see a nice cross-section of it in this run. There are several cross-streets for cars that bisect the park from east to west, but the streets are set down in lowered channels, with stone bridges for the park visitors to move north/south above the cross-streets. The main walkways go up each side of the park, East Drive and West Drive. Here on East Drive in the south end of the park, you will soon see the ice-skating rink on your left. Turn left there (this is the place to hang out in the winter) and run towards the baseball fields and playground. When you come to the ball-fields, just run right through them and check out any games going on. On the other side of the ball-fields, you will hit West Drive, where you turn right to head north again. Watch out for all the in-line skaters and bicyclists! I actually like to take one of the many smaller, less-used paths that run parallel to the larger drives. You will soon pass the Tavern on the Green, and then you'll run along the Lake, with the water to your right. 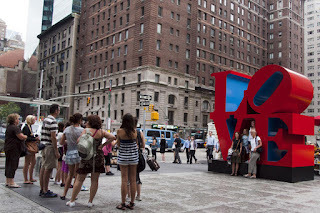 (a possible detour is to keep left for 100 meters to go to the 72nd Street entrance, with the Strawberry Fields memorial to John Lennon, who was shot across the street). After the lake, turn right to run by the outdoor Shakespeare theater and you'll come to Belvedere Castle, a Victorian-era folly with a lookout deck over its pond. 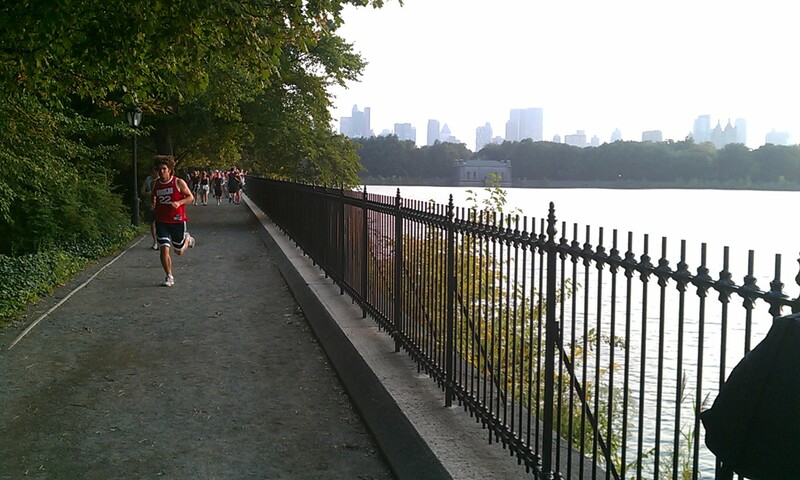 Take one of the paths going north along the Great Lawn (more baseball fields), and you will now find yourself at New York's running Mecca, the Reservoir. You will now become one of about 10,000 runners circling the water. Run clockwise for almost a full lap. It has been made a bit nicer with the replacement of the old chain-link fences with more civilized wrought-iron ones. When you get to the east side of the Reservoir (heading south), at the height of 90th Street, leave the park for a bit and cross 5th Avenue. 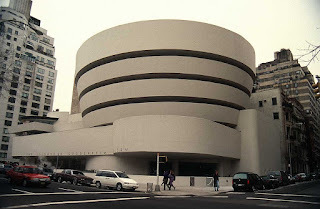 Run south one block, and you will be looking at the fascinating spiral of Frank Lloyd Wright's Guggenheim Museum. Keep running south on 5th Avenue for a few blocks, and you'll see the classical facade of the Metropolitan Museum of Art, offset in Central Park on the right. Run past the museum. Just after the building ends, at 80th Street, you'll see a path leading to the right, back into the park. Follow the path until you are behind the museum, where you'll hit East Drive. Here you can turn left and run south till you get back to the place where you first entered the park, at the Pond. We'll take a different way back to Bryant Park, now, though. Turn left on 59th Street and run east the four blocks to Bloomingdale's, on Lexington Avenue. 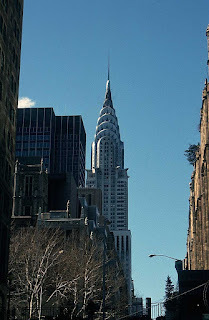 Turn right here and run down Lexington to 42nd Street, going through typical Midtown highrises, running directly towards one of New York's landmark buildings, the Chrysler Building. Turn right at the Chrysler Building, on 42nd Street, and in just a block, you'll see the classical form of Grand Central Station on your right. It's definitely worth it to detour through the station to see this amazing building from the inside, with its grand interior built at the height of the railroad era. 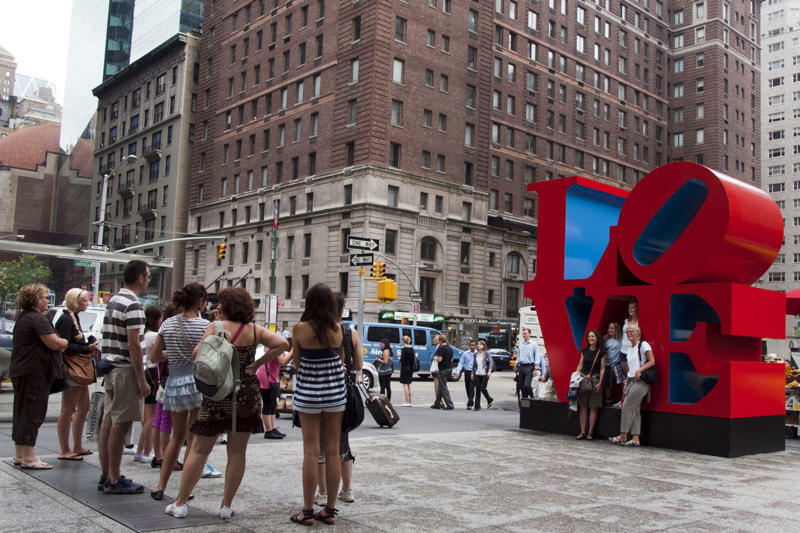 Continue up 42nd Street for just 2 blocks, and you'll find yourself back at the library and Bryant Park, ready to finally order a cappuccino, put your feet up, and simply watch the morning go by. What is the running etiquette there? I've been in NY a couple of times for work. Last time it was from The Roger to Madison Square Park and just ran around and around... looking for more straight out and back or loop. Can i even run on the sidewalk? What about the road? What's safest and correct? Thanks for your time.